PRIME showcases the aesthetic exploration of our 2015-17 resident artists: Rachel Garceau, Meta Gary, Shanequa Gay, Margaret Hiden, William Massey, Scott Silvey and John Tindel, with new works and selections from their tenure with The Creatives Project. 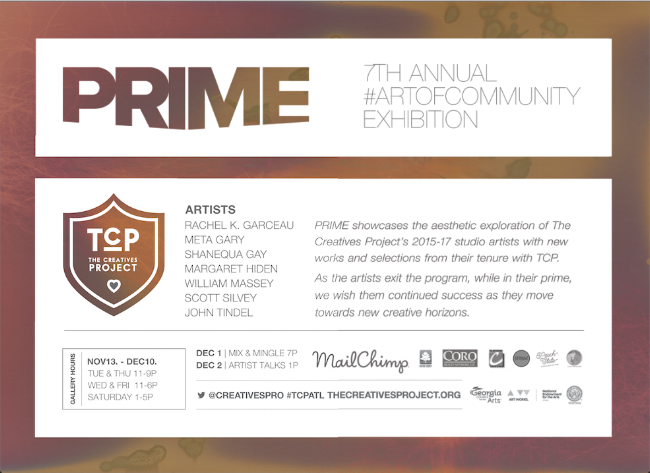 We are thrilled to present The Creatives Project (TCP)’s Annual Benefit and VIP Preview of “PRIME”. We will announce the 2018-20 resident artists as TCP celebrates the past year and many accomplishments. LEARN MORE ABOUT THE EXHIBITION AND EVENTS HERE.